When Neil Papworth sent the world's first text message 25 years ago, he had no idea what a big deal it was. "I had no idea that first text was going to snowball eventually into this thing we call texting today." At the time, Papworth worked for Sema Group Telecom as part of the team developing a Short Messaging Service (SMS) for British telecommunications company Vodafone. On Dec. 3, 1992, at the tender age of 22, he sent the first-ever text message from an office computer to the mobile phone of Richard Jarvis, then-director of Vodafone, who was attending a holiday party across town. The message read, simply: "Merry Christmas." "If I had tried to put some kind of meaningful message in there, 25 years later, like today, you guys would be talking about, 'What was he really thinking when he sent that? Why did he say that? What was the real meaning?'" Papworth said. "Whereas the fact that it was just Merry Christmas, it's just, you know, I was wishing someone a Merry Christmas. There's no other meaning to it, really." Plus, it was short. Text messages originally came with a 160-character limit. That's why people developed text message shorthand, like lol for "laughing out loud." Papworth didn't get a reply to that first message. It would be another year before phones could send messages as well as receive them. Instead, people called him from the Christmas party. "After I'd sent the message a few seconds later I got some thumbs up knowing that it had worked." That moment, he said, was followed by a very British celebration. "I guess I probably wiped my brow or something with my British handkerchief, kind of relief that it worked," he said. "But there was no mass excitement or anything like that." 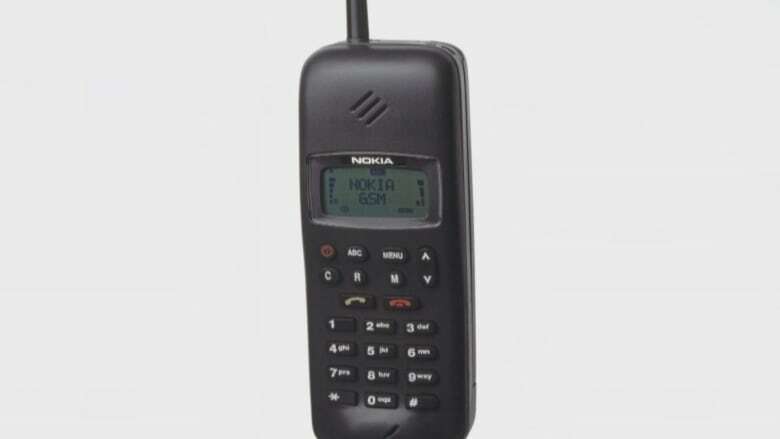 Nokia introduced the first mass-produced cellphone with an SMS feature one year later in 1993. In 1997, it unveiled the first phone with a full keyboard. According to the CRTC, Canadians sent and received 195 billion text messages in 2015, and that's not including messages sent on third-party clients like WhatsApp or Facebook Messenger, which are gaining in popularity. "From what I've read, [SMS] is just starting to dip, but people are still using it and I still think they will for awhile longer," Papworth said. "The demise of text messaging has been predicted for many years. I remember being at a 15th-anniversary party and people were saying, 'Oh, it's going to die off' kind of thing, and here we are another 10 years later." A quarter century after sending his pioneer message, Papworth said he's still pretty "old-school" when it comes to texting. He only sends a handful a day, he said, and they're usually "fairly dull." "If I put a smiley, it's the colon dash and the closed bracket. The phone might convert it into a little graphic but I don't go into, like, the emoji menu," he said. "It's just the way my brain works. I guess I'm stuck in the 90s."